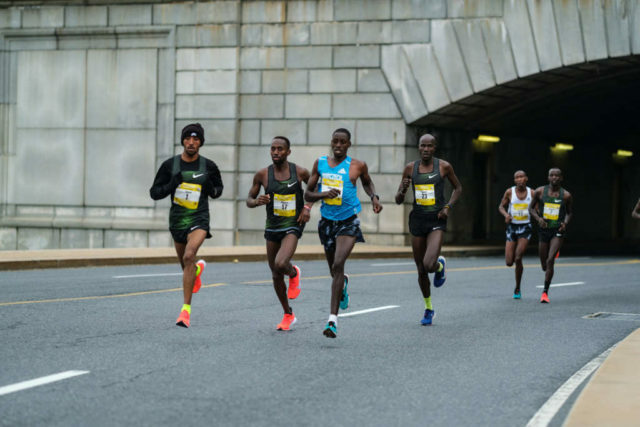 Jemal Yimer, Stanley Kebenei, Josphat Tanui and Edwin Kibichiy race the fourth mile at the 2019 Credit Union Cherry Blossom Ten Mile. Ethiopian Yimer, 22, edged Kenyan Josphat Tanui, 25, 45:36-35:38. 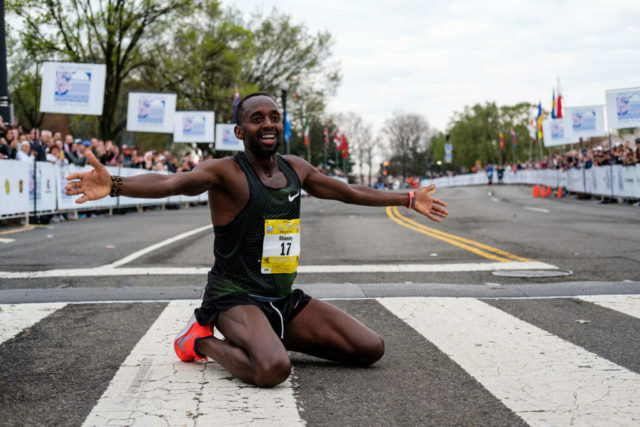 Kenyan Edwin Kibichiy, 27, closed in 45:58, with Kebenei two seconds back with a 55-second margin behind him to cousin, 2014 and 2015 winner Stephen Sambu. Yimer said his main goal was to win, regardless of the time, but finishing so far under 46:00 pleased him. Kebenei had spent a good portion of 2018 fretting about his Achilles tendon. It was why he didn’t come back to defend his title. American University alumnus Mark Leininger was 16th, 10th American, in 48:21 and Arlington’s Clint McKelvey, 27, was 23rd in 49:45. Emma Bates races Stephanie Twell in the fourth mile of the Credit Union Cherry Blossom Ten Mile. “To know I could run that close to the American record despite this is really exciting,” she said. Bates, 26, had run 1:11:13 for fourth place at the NYC Half Marathon in March a few days before she tried holding a plank while holding herself perpendicular to a vertical pole. On her third try, she tore some of her intercostal muscles, which run between the ribs. Bates, a Boise State alumna who lives in Western Idaho, has not had it easy during the last few cold weeks, but race temperatures in the 50s helped loosen things up. 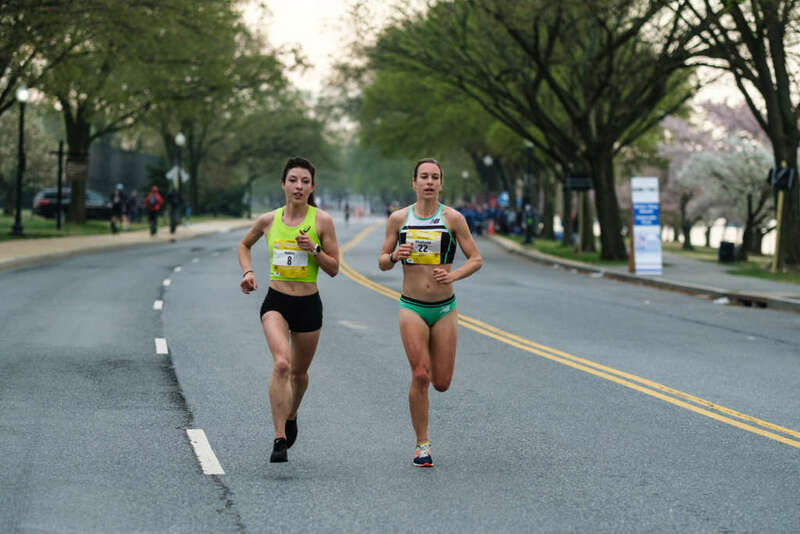 She also got a boost from her sister and her sister’s fiance, who cheered in the latter stages of the race, and from her relatively newfound fame after winning the U.S. marathon championships in December and signing a professional contract with Asics. Bates, 26 and Northport, Ala.’s Samantha Palmer, 27, took an early lead to help ensure a fast pace, but the field responded by the end of the first mile. Fairfax’s Bethany Sachtleben, 27, caught Palmer in the last half mile to finish as second American in 53:40. Palmer was four seconds back. Both preferred the lack of the customary 180-degree turn at the north end of the course’s path along Rock Creek Parkway. Construction near the Kennedy Center forced the race onto I-66 for the return trip south. Kenyan Rosemary Wanjiru, 24, set a record for the fastest 10 miles on U.S. soil in a women’s-only race, running 50:42, well below the 51:44 that Tebya Erkesso ran for the 2007 Cherry Blossom race. Ethiopian Gotytom Gebreslase, 24, was five seconds behind, with Kenyan Margaret Muriuki, 33, 51 seconds back. 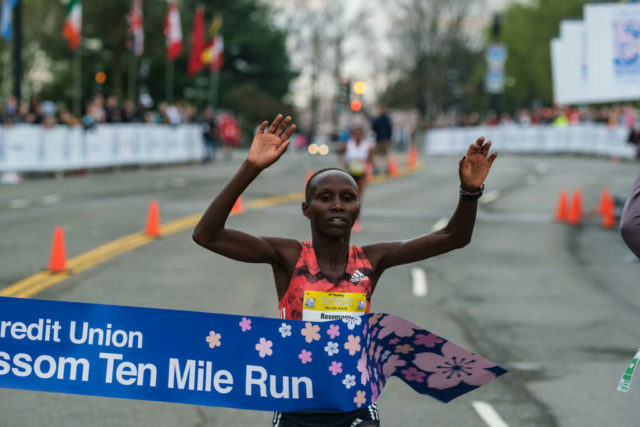 Rosemary Wanjiru breaks the tape at the 2019 Credit Union Cherry Blossom Ten Mile.